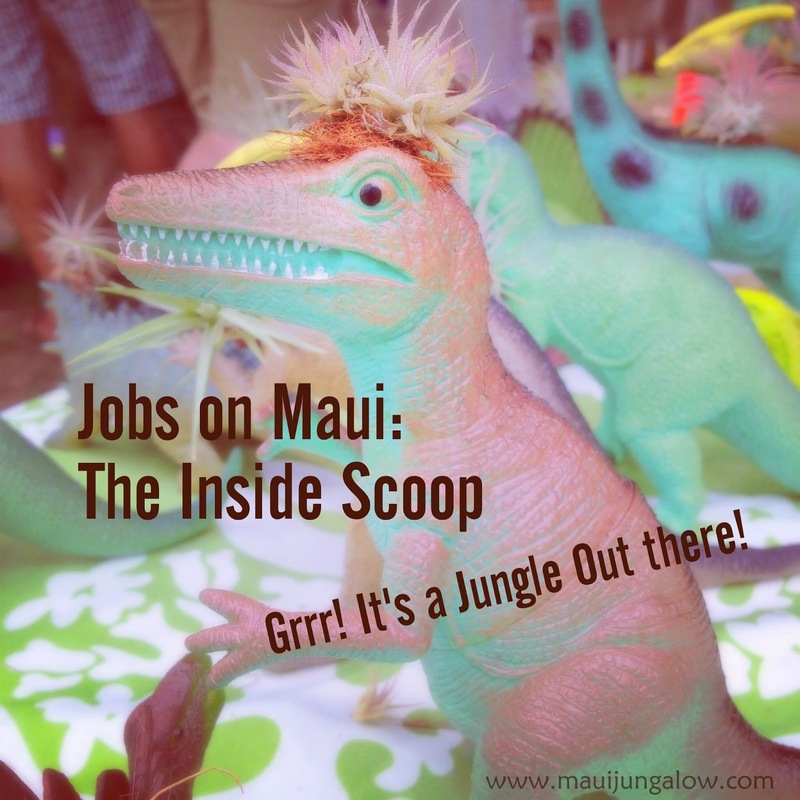 Yes, people actually have real jobs on Maui. Not all of us are lounging by the pool sipping mai tais or competing for the best suntan on the beach. Who has to work on Maui? Anyone who isn’t independently wealthy (including trust fund babies and heirs of family fortunes) or successfully retired. This could be you, if you have to work three jobs to stay afloat! As an aside, I know two people who are trust funders, and I had always thought that trust fund babies were the beautiful people of Maui sipping mai tais by the pool and glistening in the sun. I was so wrong. Trust funders can blend in with the rest of us and collect welfare, social security, free health care when possible, and work the system just like any poor Joe. What kinds of jobs exist on Maui? Real estate – it seems like half the people I know or meet are practicing real estate, and the other half is getting licenses! Jobs are not generally high paying, unless it’s for a highly specialized or desired skill set. Whatever they may pay on the mainland, it might be 20% less here. Don’t quote me. It’s only one person’s opinion. trying to find work on Maui. If your skills are desired or you're in the right job, Maui pays well. A friend who was a nail manicurist made much more on Maui than in a small town on the West Coast. I've heard of stories of PhD's on Oahu who make more as hotel bellhops than they would teaching because the tips are so good. Often people have multiple jobs here to make ends meet. I know people who work a county job by day and a retail job at night. Or they have two retail jobs, or sometimes three jobs! When DH and I moved here (we both used to live on Oahu), he worked 60 hours/week and I worked two jobs at about 50 hours/week. I thought we would save up for a house. Ha ha ha. After the 2008 recession, my hours went down drastically but my life got more balanced. 1. Keep part time jobs to under 20 hours/week. If it goes to 20 hours or more, state law requires that the employer provide health insurance to the employee. 2. Avoid hiring new people who have been on the island less than a year. They believe that people who move here will flake out and move back to the mainland. 3. Hire people, if they can get away with it, as independent contractors rather than employees. This avoids social security taxes, unemployment compensation, and lots of bureaucracy. Here's a shortcut to the archives for the A to Z Challenge and other blog posts. The theme of this year’s A to Z Challenge is Living on Maui: A Beginner’s Survival Guide. While I can’t include everything in only 26 short blog posts, this is my foolish attempt. If you are participating in the A to Z Challenge, please use either Disqus or Facebook to comment below. Please include your link so that I can visit you back, but it might be as late as May! I'm imagining you sipping mai tais at the beach! Great post Courtney! I look forward to seeing more of Maui through your Blog! Sounds like a pretty cool place to live. Fascinating. I can't say I've ever really given it much thought, beyond tourism related work. Exactly what you did. Also I stopped by your blog, letter F and gave you some HTML code to use on wordpress sites - so that the link to your site is clickable. Wordpress and Blogger/Blogspot behave differently. Interesting post Courtney thank you. Seems as if 'some' employers will do anything to ensure that their employees don't get benefits. As you say on the upside less hours also meant for you, a more balanced life. eXodus – Why do People Move From Maui? Taxing With Aloha – Hawaii Loves Your Taxes!